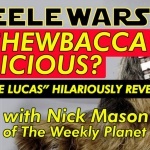 VIDEO : Is Chewbacca delicious? 'George Lucas' hilariously reveals all. With Nick Mason.